Coding sequences for a cerulean (CFP) fluorescent protein gene were inserted into the exchange cassette. In this manner, CFP is constituitely expressed under control of the endogenous ROSA26 promoter. The exchange plasmid also contains a 51bp translational enhancer (5' leader sequence from Xenopus beta-globin), a Kozak sequence upstream of the start codon, and intronic a polyA sequences from the rabbit beta-globin gene that confer stability to the mRNA. 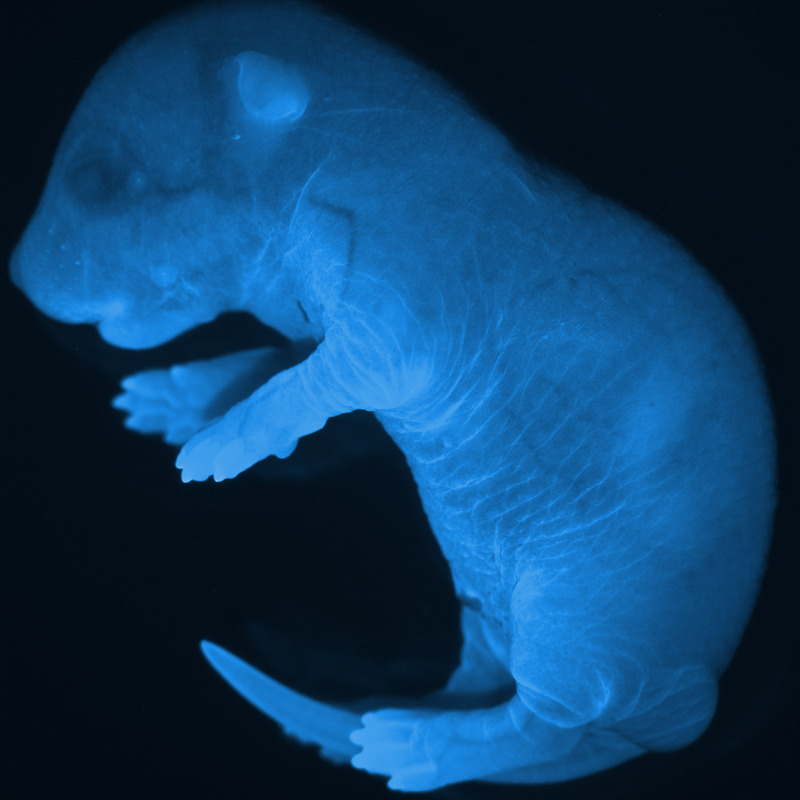 This mouse line contains a loxed cassette acceptor (LCA) allele in which a 5.17 kb region of the gene has been replaced by a lox71 site, a puromycin-(delta)-thymidine kinase fusion gene driven by the mouse phosphoglycerol kinase promoter, a kanamycin resistance gene driven by the bacterial EM7 promoter, and a lox2272 site. 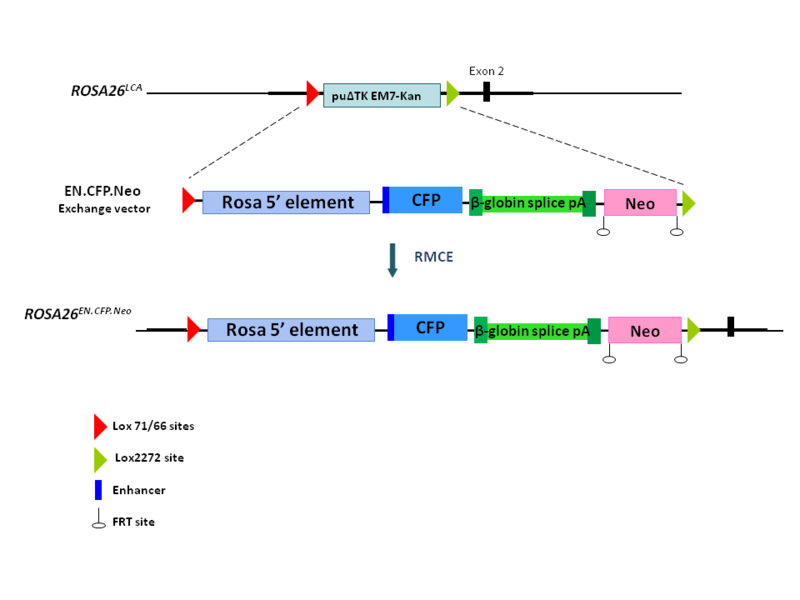 These features enable use of Recombinase-Mediated Cassette Exchange (RMCE) for the rapid insertion of various DNAs into the Rosa26 gene locus. The pRosa.EN.CFP.bGsplicepA.Neo exchange vector was made on a backbone of a basal exchange vector which contains a 4.081 kb sequence from the Rosa26 locus, Lox71/Lox2272 sites, and a flrted (flanked by FRT) Pgk-Neo cassette that is used for positive selection of ES cells after RMCE. A 5' translational enhancer-CFP-intron-containing rabbit beta-globin polyA sequence was inserted (in place of Rosa26 exon 1), between the Lox71 and the Pgk-Neo sites. Founder chimeras were crossed with C57Bl/6J for 4 generations. 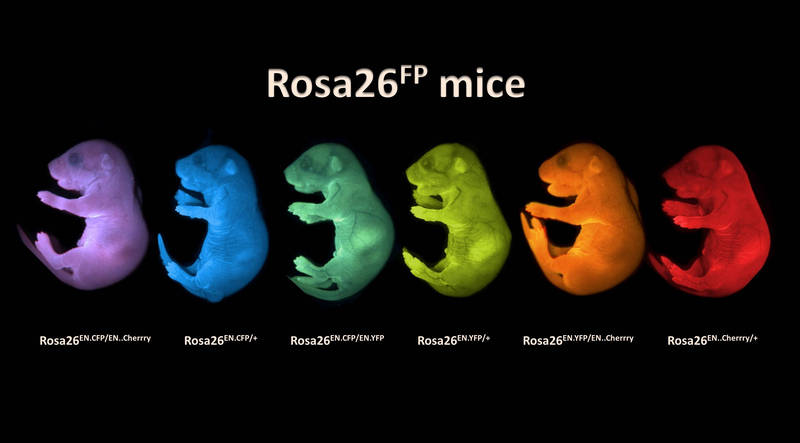 The images of newborn offspring from intercrosses of Rosa26Cherry/ ,Rosa26CFP/ and Rosa26YFP/ mice were taken with a stereoscope using CFP, YFP and RFP filter and subsequently overlayed. The image of Rosa26CFP/ mouse was taken with a stereoscope using CFP filter.